What a waste of energy. Also, why do you need something outside to tell you what the weather is like outside? Ah, I think you work at a newspaper. You’re just scared the bins will take your job. I think this is just an example of old ideas trying to make themselves relevant. Not scary, just a bit sad. 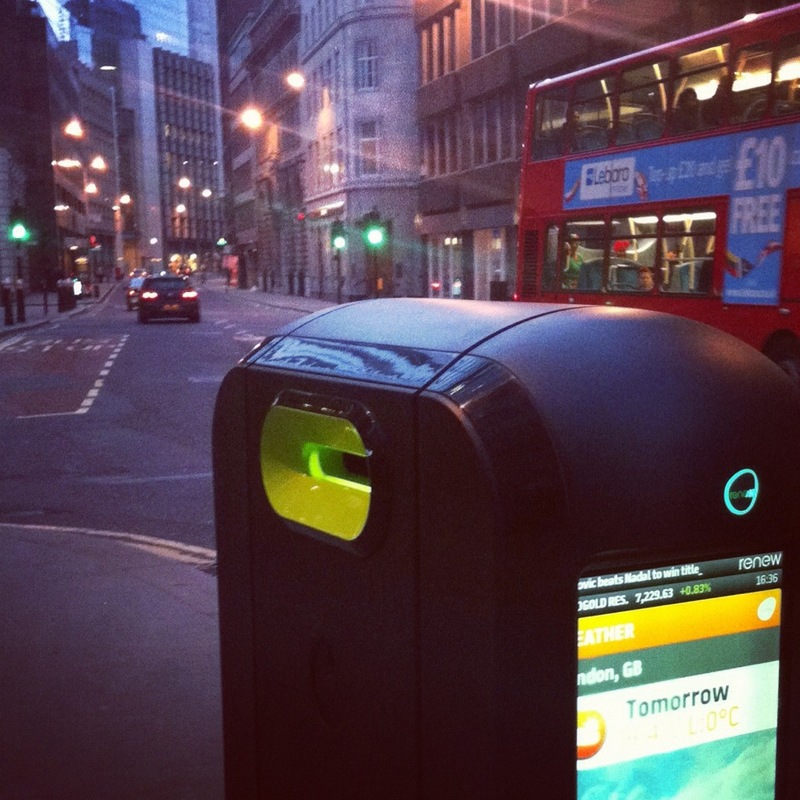 All part of ‘the nudge’ – attention drawn by information, see a recycle bin, use a recycle bin. However, if it is going to give news headlines and adverts as well is it a case of ‘garbage in, garbage out’? Nudge idea is a good point, one of the weird things about it is that it doesn’t (to me at least) look like a recycling bin, but maybe the fact that it gives news will make you put your Metro in it. Maybe. This is brilliant. When the top face has an interactive sudoku on it, newspapers will be no more. Surely “provides weather, travel and news updates plus adverts for the local McDonalds”? At least I hope it’s ad-funded; I’d hate to think public money was funding it. It’s in the City of London, so maybe they paid…? My thoughts exactly. What must the carbon footprint of this thing be? Somebody is seriously missing the point of recycling. Yes, the first comment from Dawn also said what a waste of energy, which occurred to me too, though I would like to actually know how much energy these things use. 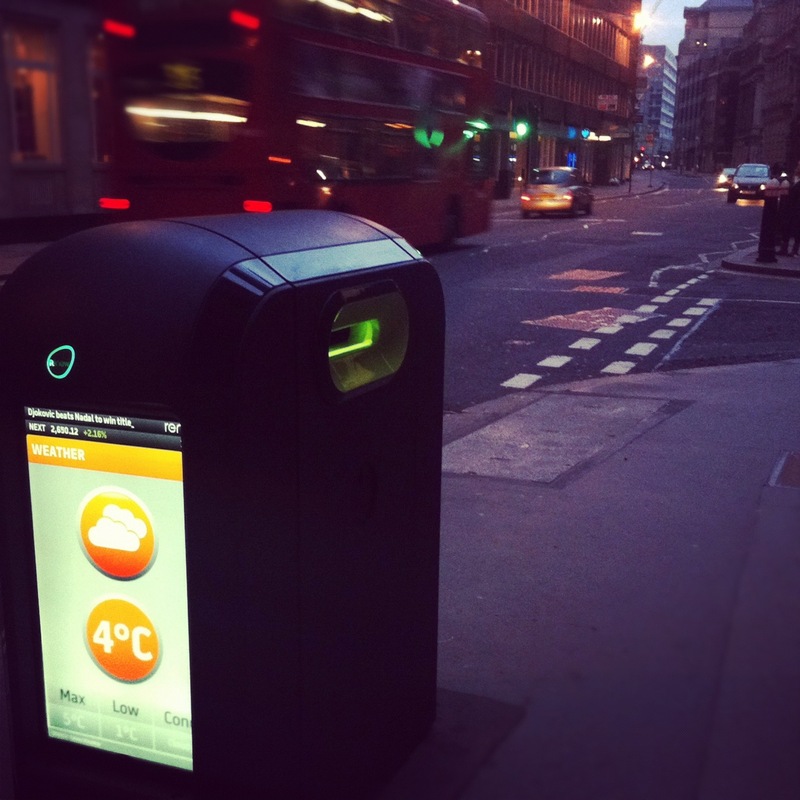 Hello, bit late to the comments party, but here’s the website for the bins: http://renewsolution.com/. Apparently they have a 21 year tender from the City of London Corporation to tackle the problem of free newspapers being dropped on the streets. It’s clear they see themselves as providing a media network first, the bin is just there to dispose of the opposition, they play up their green credentials as replacing the need for paper production and distribution. next week, and I am on the look for such information.